To set clear, consistent and rigorous standards, understood by students, parents and staff. To ensure that expectations of all students are high and that all students are suitably challenged given their previous attainment. To provide easy to understand information to students and parents about what students can do and what they need to do to improve further. To provide relevant information and guidance to teachers to accelerate learning and improve their practice. To provide the school with reliable data, free from bias, in order to track individuals and groups and deliver the appropriate provision to all students. Clear, consistent and rigorous standards provide the backbone to all the learning in the academy. They are essential to everything from the development of our programmes of study down to individual lesson objectives. They provide the focus for all forms of assessment and any resulting actions that staff and students might take. It is therefore key that standards are shared and understood by students, staff and parents and that we have a shared understanding of what quality looks like. Students will be graded using the A*-E descriptors provided by exam bodies. In those subjects where GCSEs continue to use A*-G grades, departments will use the descriptors provided by exam bodies. For subjects using the new 1-9 grades departments have developed their own descriptors. These will be referred to as TG1-9 grades and have been created using many sources of information including new and legacy programmes of study and work with our partner schools in the trust. These have been developed as it is unlikely that the government will ever produce detailed descriptors for each subject. In response to the commission on assessment without levels report the KS3 assessment will be based around a mastery approach where all students will be targeted with exceeding a ‘minimum expected standard’ and monitored closely using low-stakes assessments. The expected standard will be based on descriptions of content and skills linked directly to the programme of study and schemes of work for each half term. A student will be considered as to have met the minimum expected standard for each half term if they are on track to achieve a Grade 6 or above in their GCSEs in a particular subject. In addition to covering the national curriculum KS2/KS3 attainment and the key skills and attributes that students will require if they are to be successful in their GCSE studies these descriptors will embody the expectations of what we believe at Tudor Grange to be a successful and rounded practitioner of each subject. The academy recognises that grade descriptors alone are not sufficient to fully illustrate the standards that we wish students to work towards (This was a key concern raised in the report by the commission on assessment beyond levels) Consequently, to ensure our standards are communicated effectively and rigorously defined, departments have linked their descriptors to examples of students’ work and specimen questions and produced various rubrics to support students’ understanding. 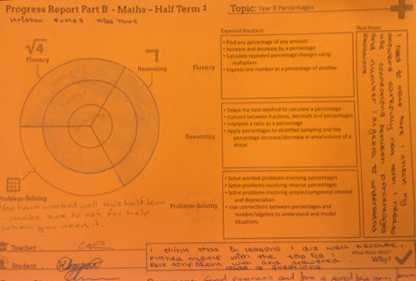 Targets for KS5 students will be set using each student’s GCSE average point score and ‘Level 3 Value Added’. Each student will be targeted to be at least +0.5 grade above the national average over the average of their qualifications. 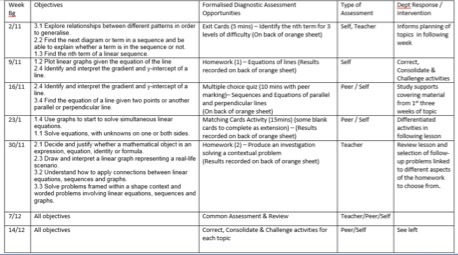 Targets for all students in KS3/4 will be set using FFT apsire. In this way all students will be challenged appropriately given their own starting point. These targets will be reviewed annually against data from raise-online and FFT to ensure they remain in line with national outcomes and may therefore change throughout a student’s school life. Each student will be targeted at least +0.5 grade above national standard over the average of their qualifications. Staff should draw upon a wide range of formative and summative assessments to determine their judgements about students’ current attainment and predicted grades such as discussions with students, evidence from marking books and grades obtained in common assessments. In KS5 students’ progress will be tracked each half term using their current attainment data and target grades. In KS3/4 the progress of each student will be tracked each half term using their current attainment data and the appropriate subject flightpath. The flightpaths reflect individual students’ KS2 starting points and GCSE target grade and reflect the progress students should make in that subject. Progress data is collated for staff and returned in a number of formats to suit different job roles and types of analysis. All staff should analyse the information relevant to their job role to identify where the best practice is occurring and why. Line-management meetings should be regularly scheduled to discuss interventions stemming from the information and the success of those interventions. In addition to a termly progress report KS3 students will receive a half-termly progress report part B outlined in the sections below. The difference between formative and summative assessment is not the form of the assessment itself but rather than treatment of that assessment afterwards. This section deals with assessments where students’ work is required to be judged explicitly against either the standards set out by the academy in the sections above or against nationally recognised external standards. On entry to the academy all students will be assessed using CAT4 tests. Besides providing information about each student additional to national test scores at KS2 the CAT4 assessments will allow the academy to track each student’s national percentile ranking (NPR) for literacy and numeracy (see moderation tests below). Each half term every subject will assess students against the academy standards, as outlined above, through a planned and moderated piece of work. Subjects can decide what form of assessment is most appropriate for the students given the content of the programme of study. However, in recognition of the fact that different forms of assessment are often more suited to assessing one type of knowledge / skill than another, subjects must ensure that students are assessed using a wide range different types of assessment during the course of each year. As part of quality assurance subjects will be required to provide evidence of the moderation process and variety of common assessments. 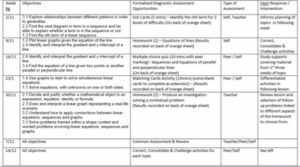 To ensure that student, parent and staff communication and understanding of the ‘minimum expected standard’ in KS3 is consistent across the academy, subjects will be required to assess students every half term using the progress report part-b. Subjects need to ensure that the report is signed by parents and where possible stored in students’ books alongside the relevant work it relates to. 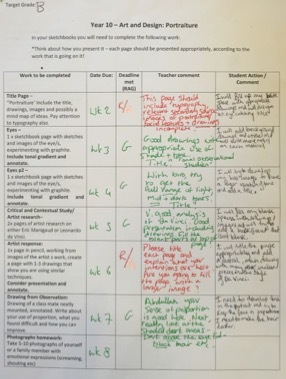 Although there is not a requirement for subjects to use a tracker such as the ‘progress report part-b’ in KS4/5 there is an expectation that subjects will nonetheless provide students with clear and regular information about the standards that students should be working towards (see formative assessment guidance below). To prepare students for linear exams at the end of their GCSE and A-Level courses, students take end of year exams each summer. All exams in KS3/4 will be assessed against 1-9 grades (apart from legacy GCSEs). As part of quality assurance, subjects are required to produce evidence of how they have moderated the tests in line with national standards. Subjects are required to moderate all their common assessments and end of year tests to ensure that there is consistency between staff and also against national standards. Subjects use end of year test and examination outcomes as a standard with which to measure the effectiveness of other assessments throughout the year. The academy also utilises external assessments (GL assessments) to ascertain student national percentile rankings in English, maths and science to track if students remain in-line with national standards. These rankings are also used by all subjects to provide further evidence when moderating work. From this definition it is clear to see that high quality formative assessment is the most important ingredient in the best examples of teaching and learning. Furthermore, it should be evident that formative assessment should take place throughout all aspects of teaching and learning. For example: Analysing end of year exams to plan the curriculum for that cohort for the following year; Reviewing termly tests to see which topics might require more time after the holidays; Using a homework to decide what to focus on in the last few lessons that week; Issuing exit cards to help plan the lesson the following day; Displaying a multiple choice question to facilitate a discussion at the end of a lesson; Using mini-whiteboards during an activity in class to keep track of student understanding as harder concepts are introduced. An essential part of most formative assessments is that they are low-stakes and not linked directly to grading. It is within this environment that students feel able to share their understanding without fear of failure. Given the enormous range of forms of assessment available it is not practical or desirable to set out a rigid structure for formative assessment. Therefore, the academy defines a number of key principles that all subjects should adhere to and make part of their own schemes of work, teaching and learning. Students must understand what they are meant to be doing. They should come to hold a concept of quality roughly similar to that held by the teacher. Students should be provided with the scaffolding to assess their own work against these standards. However, there is a careful balance to be achieved between helping students to be able to judge the quality of their own work and leaving them enough space to develop their own understanding independently. If guidance is too prescriptive students will not gain the necessary skills to work independently, but if guidance is too vague, students will not be clear about the next steps they need to take to progress in their learning. Therefore, staff should make a judgement about how detailed a rubric they share with students depending on what they want to achieve for each topic. One of the key factors of good learning is that the skills that students learn should be transferable between different contexts. We are not simply interested in students’ being able to replicate what we have taught them but also that they can apply what we have taught them to similar situations (or not very similar situations in the case of higher achievers). Therefore, staff must also ensure that learning outcomes are written carefully to avoid focussing too much on the context they are being taught through. For example, in KS3 subjects use the concept of ‘minimum expected standard’ to base their learning outcomes upon. These reflect both the content that needs to be covered during KS3 and also the key skills that students must gain in order to be ready to move onto their GCSEs. These are shared with students at the beginning of each unit and then referred back to regularly throughout the rest of the half term. Students are given regular opportunities to assess themselves against these standards (see below for learning checks). These are designed to help students develop a ‘nose for quality’ and help them self-regulate their own learning. Departments have similar, but bespoke systems in place for KS4/5 in accordance with the requirements of the qualifications students are working towards. In the best classrooms there is a feedback loop between the teacher and the learners. Staff constantly adjust their plans and activities to reflect what students have and have not learnt. Teachers get feedback from students in many ways but the most successful teachers plan activities and questioning within lessons to elicit exactly what students have understood. These activities are not designed to rank or grade the students but rather to help the teacher decide what the next steps in learning will be. Excellent teachers are wary of the feedback they receive from students and check to see that they are not getting the correct answer for the wrong reasons. Consequently, their assessments and questioning are planned carefully to reveal common misconceptions and misunderstandings. They are not simply interested in if a student’s response is correct or incorrect, but actively listen to the student and engage with the content of their answer to determine the best path forward for that their learning. Teachers plan their questions carefully using stems and taxonomies such as Bloom’s. They do not accept students ‘opting out’ of answering questions and will use a variety of methods, such as ‘no hands up’ and ‘think pair share’, when taking answers to ensure that all students are engaged. They give adequate, but not excessive wait time to allow all students to participate. Feedback should be focussed on moving students’ learning forwards and not on general praise or criticism. It is most effective when it is not linked directly to grading. For example, it is always better to review a test before sharing the final scores. Feedback should be related directly to the learning outcomes previously shared for the task. The best feedback scaffolds students’ understanding so that they can meet the learning outcomes themselves without giving away the answer to them. In the best examples it will cause further thinking in the learner to spur them on to find the answer. Consequently, in most cases teachers should aim to be doing much less work than the students. 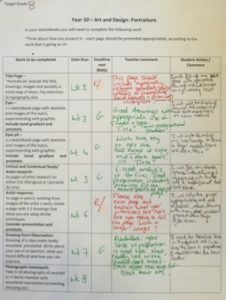 The form of feedback, whether it is verbal or written, is not important (However learners should regularly receive both from teachers – see marking below). What is important is that the feedback forms the basis for future action and therefore students must be given adequate time and resources to take that action. Techniques such as ‘DIRT’ time should be indicated in the programme of study and time should be set aside in schemes of work to allow these activities to take place. Feedback should also be provided in a timely fashion so that it can be used to inform future learning. It should not take the role of a ‘post-mortem’ when the opportunity to improve has already passed. When giving feedback teachers should be mindful of the positive and negative effects that it can have on students’ motivation. Teachers should encourage students to have a growth mind-set about their ability and understand that all learning is incremental. Learning checks are an additional pre-planned and departmental wide assessments that should complement the formative assessments that staff should be completing in the course of their usual teaching. The learning checks should take place to coincide with the completion of key learning objectives as identified by the department. There is no prescribed number of learning checks that should take place. However, if a department has identified 5 expected standards to be met in the half term there will probably be about 5 learning checks. Learning checks should be planned into schemes of work and all staff within each department must complete them with their classes. In addition to planning how they will assess the students, it should also be clear from the scheme of work and related curriculum materials what the possible next steps for the class could be. For example, subjects might plan different ‘gap tasks’ for students depending on their level of understanding or which topic areas require more work or study supports might be planned for different groups of students. Some departments use ‘correct, consolidate or challenge’ as a helpful structure. These assessments are equally important as an opportunity for staff to share good practice and provide them with examples of high quality questions as they are an opportunity to assess the understanding of students. Staff should work together in teams to moderate the learning checks and plan their next steps. The learning checks should be planned carefully to provide the maximum information for the least effort from the staff. For example, they may be a carefully worded multiple choice question linked directly to the learning outcomes set out in the scheme of work. It is essential that there must be no opportunity for false positives to arise from the wording of the questions as this may result in the wrong intervention being planned for the class. Although these learning checks may take a great deal of time to produce the information that they elicit is essential to drive forward learning. In addition to this, it is an under-recognised fact that although lesson plans from other teachers are often hard to replicate, a high quality question can always be used again and again. Optional space for any additional comments from staff indicating ‘What Went Well’ and ‘Next Steps’. Space for the student to respond if appropriate or an indication of where the student responses to the targets are. Teachers mark in green pen, students in red. Other work, not selected by the department for marking, should be scanned for quality of presentation and to identify any examples of excellent work that can be praised. It is the responsibility of all teachers and support staff within the Academy to promote high levels of literacy and articulacy. At the simplest level all staff will encourage the development of spelling, punctuation and grammar through their marking and by using the annotation guidance alongside focused comments. Subject areas will incorporate into their policies key strategies to help develop literacy across the curriculum. Subject areas are encouraged to use some of the following strategies to support; writing frames to scaffold learning with support reducing over the medium to long term, attention to the spelling of key words within each topic and also the commonly misspelt words, the use of keywords to help pupils expand the use of language in their written/spoken responses. 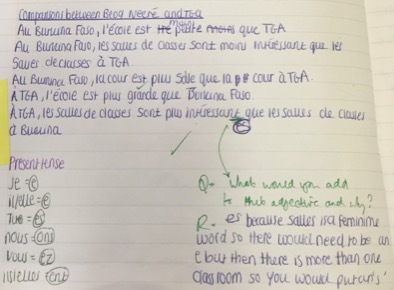 Any feedback to pupils related to annotations (Sp, Gr etc) should promote thinking and then action from the pupil. Where common misconceptions exist then group intervention might be considered in relation to basic literacy. Code What does this mean? Sp + circle Spelling error. The part of the word spelt incorrectly is circled. Find the correct spelling and write out 5 times. Use look, cover and check method or break the word up into ‘memorable chunks’ to practise the correct spelling. P Punctuation error You have used a punctuation mark incorrectly. Insert correct punctuation or amend highlighted punctuation. Find out why the change is needed.
! ? . , ; : – “ …. C Capital letter error A capital or lower case letter is used incorrectly. Look closely and make the correction. Gr Grammatical error The sentence is not clear and does not make complete sense. Re-read and correct so that the meaning is clear. 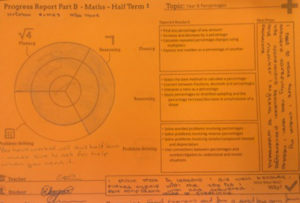 VF Verbal feedback given Record the main points of your discussion with the teacher about your work. 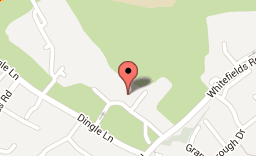 Δ Presentation point Some aspect of presentation requires improvement. Amend for next time.